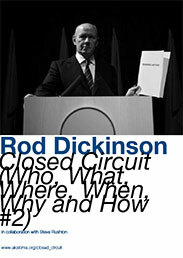 Closed Circuit is a new video installation by Rod Dickinson in collaboration with Steve Rushton. Set in a meticulously constructed press conference environment, two actors deliver a simulated government briefing. The script of Closed Circuit was written in collaboration with writer Steve Rushton, and is composed solely of fragments of press statements and speeches delivered since the Cold War. The script focuses on the way in which similar declarations have been used by numerous governments - across continents and spanning the ideological divide - to declare and maintain states of crisis and emergency. The fragments are woven together irrespective of context and date - the only change to the original material is to remove any specific mention of people, places and dates. Consequently, the who, what, where, when, why and how are removed from the spoken text. The viewer is drawn into the speech by the seamless and forceful delivery of the actors, whilst the documentary sources of the script are revealed simultaneously on two presidential style autocues which display the scrolling script of the speech and expose it’s repetitive, fragmentary and modular structure. The political speech and government press briefing are long-established tools for the management of crises, emergencies and conflict in democratic societies. Whether used as a mechanism propagating government policy or for raising a nation’s morale, the speech and press briefing are tried-and-trusted strategies from which politics is staged. Since the beginning of the televisual age, the government briefing has become locked into the circuitry of television and real time media. Just as the crisis is always in the present, the live-ness of television calls the present forward and this in turn shapes political and social reality. The video installation Closed Circuit derives from the performance, co-produced by the institute Aksioma and the institute Bunker, which was staged as part of the international festival Mladi levi in August 2010. Rod Dickinson’s work explores ideas of belief and social control. Using detailed research into moments of the past and present, he has made a series of meticulously re-enacted events that represent both the mechanisms that enable belief, and the social systems that underpin much human behaviour. His previous works include a recreation of Stanley Milgram's infamous 1961 social psychology experiment Obedience to Authority (The Milgram Re-enactment, 2002), and a recreation of the media surrounding a bomb attack on Greenwich Observatory in 1894 (Greenwich Degree Zero, 2006). Supported by the University of the West of England, the Ministry of Culture of the Republic of Slovenia and the City of Ljubljana.